(Bloomberg) – Members of the Gupta family, who’ve been implicated in looting billions of rand of taxpayer funds in South Africa, were denied permission to give testimony from outside the country to a judicial panel investigating the alleged graft. 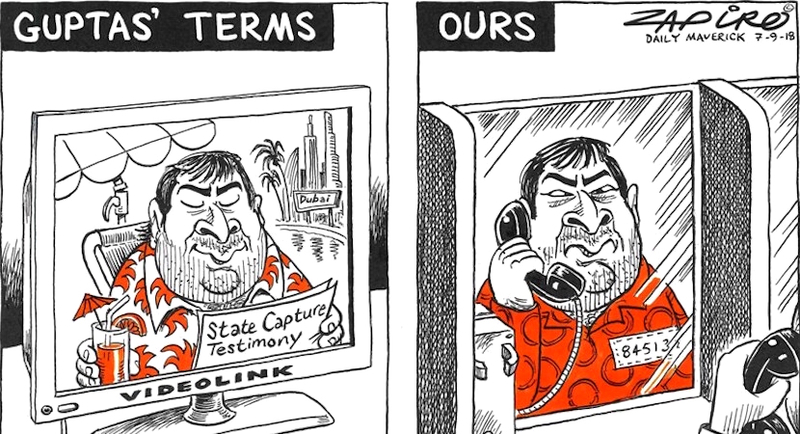 Gupta’s terms. 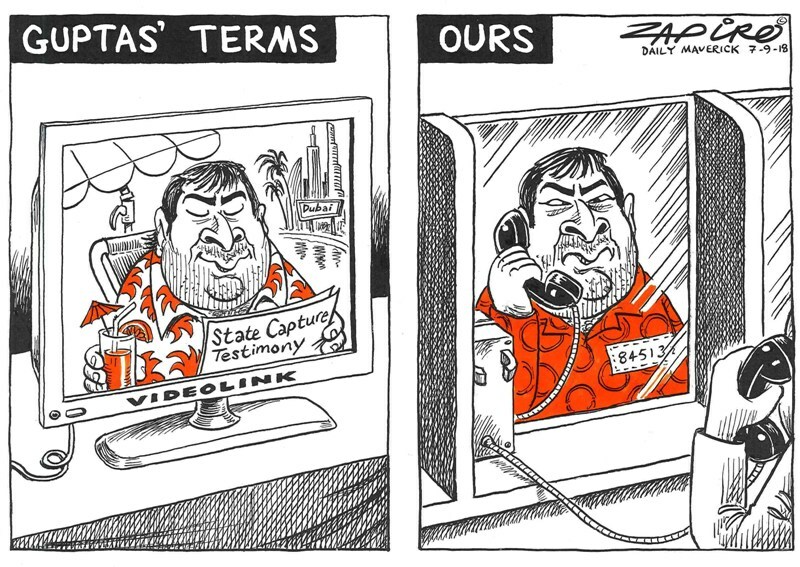 More of Zapiro’s work available at www.zapiro.com. The Gupta brothers, who’ve been seen in Dubai and India, have argued that they could be arrested and prosecuted by reckless and incompetent authorities if they agree to return to South Africa. The brothers couldn’t be held to account if they lied or defied orders to produce evidence if they testified in another country or by video conference, said Deputy Chief Justice Raymond Zondo, who heads the judicial panel. He also denied an application for their lawyers to be allowed to cross-examine witnesses in their absence. The Guptas are friends with Jacob Zuma, who was forced by the ruling party to resign as president in February, and were in business with his son, Duduzane. The nation’s former anti-graft ombudsman alleged in a report that the brothers may have used their political connections to influence cabinet appointments and the awarding of state contracts – a process that’s become known as state capture. She directed that the judicial panel be established to investigate the matter further. Former Finance Minister Pravin Gordhan, who now oversees state companies, has said more than R100 billion ($6.7 billion) may have been stolen. Zuma, his son and the Guptas all deny wrongdoing. Duduzane Zuma has agreed to testify before the commission. He was granted permission to cross-examine former Deputy Finance Minister Mcebisi Jonas who accused him of arranging a meeting with the Guptas, during which he was offered the post of finance minister and a bribe in exchange for business concessions. The panel is due to resume hearings on Sept. 17.